I loved our house from the moment we first walked in. I also hated the kitchen from the moment we first walked in. Orange builder-grade oak cabinets, laminate countertops, fluorescent lighting, and lime green walls. SO. MUCH. GREEN. But, I still loved it and saw so much potential, and immediately started planning an update. A few weeks ago we finally began the project, and now, eight months after moving in, we have a new kitchen! It all started with the countertops. 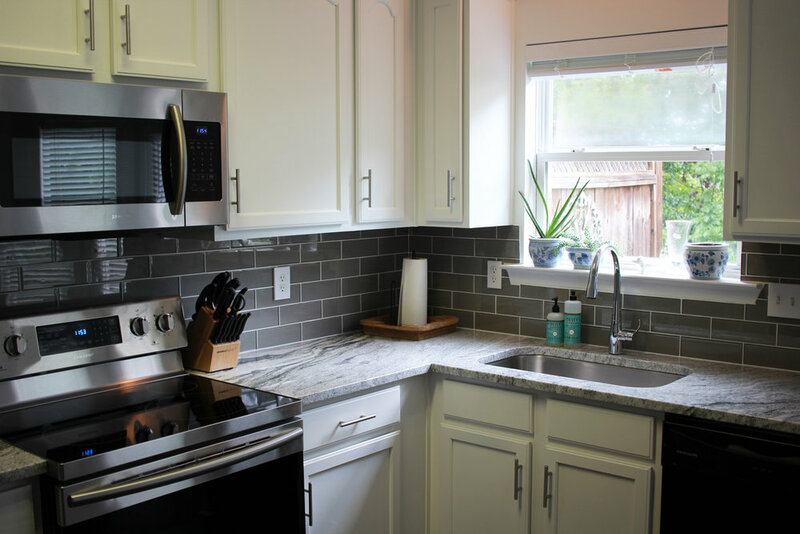 We found some remnant slabs we loved, and they fit perfectly in our small kitchen and saved us some money. After the countertops and the new sink were installed, I spent about a week and a half cleaning, sanding, priming, and painting the cabinets. Jason drilled new holes and installed the new hardware and the sink faucet, and then we installed the new backsplash together. (A word of advice: don't choose a glass tile. Just don't.) A new stove and microwave were delivered yesterday, and after a few weeks of blood, sweat, and tears later and we have a brighter, more beautiful space! It really changes the look of the whole downstairs space. I am so proud of the work we put in, and I love how it turned out. Scroll through for some photos of the new space! Aside from my fashion sense, I’d say I’m a pretty cautious, play-by-the-rules type of person. I like to arrive early, I rarely stray from my “usual” at more restaurants than I’d care to admit, and I always have a plan. It's my comfort zone, we all have one! I’ve noticed, though, a little bit of a shift. As I’m starting to feel more and more in control of my own life, without my parents or school to guide me along, I’ve begun to make bolder, more daring choices. I decided to take a job that was somewhat outside of my degree field, halfway across the country, and live hundreds of miles from J while he finishes school and starts his own career. All of this has been scary and hard, but I have a clear picture in my head of what I want my life to be like and I get closer every day. Now that I've started my career and am settling in to life here, I'm trying to keep that mindset going and not get stuck making "comfortable" choices. It really helps to see daring choices being made all around me! One of my best friends is an amazing artist and designer, and is making her own dreams happen (follow her here & find her work here). She’s also co-launching a digital magazine (which I will be a contributor for!) with another friend of ours, who is also an amazing graphic designer (follow her here). So watch for that in the future, and keep pushing yourself! ...Hello Korin is headed to Dallas, y’all! So, I spent this summer working as an intern in the automotive manufacturing industry, writing training programs. I learned a lot, but mostly what I learned was that I did not want to work there long-term. Fast forward to hundreds of applications and several dozen interviews later, and here we are! I’ve landed my dream job: fashion editing and writing for Neiman Marcus. I know, right? So now it's time to pack up everything I own and move 900 miles west to the lone star state. I'm excited and nervous and hopeful. I finally get the chance to let my creative side back out, and I couldn't be more thrilled! I hope to use this opportunity to grow in all my creative outlets and to start establishing my career. And do you know what else this means? Many, many more experiences to share with you! I can't wait! Now that I’ve gotten my degree, I not only will have much more time to keep this place alive, but I’ll also have more interesting topics to share! No more textbooks and term papers for me (unless I decide on grad school). I’m hoping to use this site to share my experiences with job interviews, recipes, new cities, and living on a budget. So welcome back! Tell your friends!